All rights reserved. No part of this book may be reproduced in any form or by any electronic means, including information storage and retrieval systems, without permission in writing from the publisher (or from the authors), except by a reviewer who may quote brief passages in a review. To decrease the downloadtime we have split the whole book in 2 parts. Please make your choice by clicking on the link (part #1 or part #2). What in the world (and beyond) is going on? Who are the communication partners on the other side? 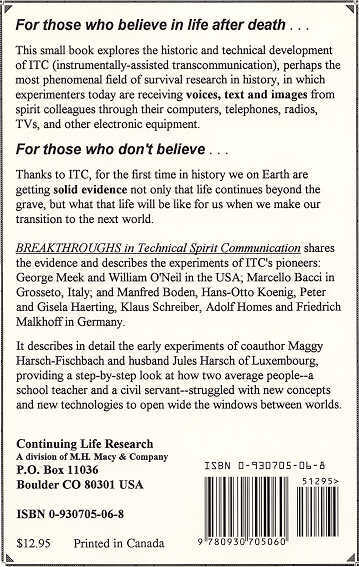 Telephone contacts with the beyond are possible! Manfred Boden - Kenneth Webster - Can a computer pick up telepathic messages? What is expected of us? Will people's views and attitudes change? For decades the dead have been making themselves seen and heard. Are our concepts of reality and our attitudes going to change drastically? It is vital to publish this book for historical records, as it explores in depth the beginnings of a field of research that is bound to cause tremendous changes in the world. You are visiting our website: W rld ITC.org To reach our homepage click here please.